Posted on February 26, 2010 by Kathy T.
In a a couple of conversations this week, I was struck by how many kids we have in LaVergne who may be hungry and how many families need help now for the basic necessities like housing and food. Schools, churches, recreation and community centers, playgrounds, multi-family housing projects, fire halls, parks, and camps can serve meals in neighborhoods with high percentages of low-income families. These venues are safe and familiar locations where children may naturally congregate during the summer. There are two ways to get involved with SFSP. Your organization may become a SFSP site where meals are served, or a SFSP sponsor that both serves meals and keeps track of the accounting and paperwork. Sponsors are reimbursed for all meals served that meet USDA’s nutrition standards. Join us to learn more and hear the benefits to being a part of the Summer Food Service Program! Sessions focusing on a variety of communities and community-based organizations will be held over the next week. Please see below for specifics on each call. What: Learn About Funding and Resources to Feed Hungry Children in the Summer! Participation: These sessions will be available via Microsoft Office LiveMeeting (Webinar) and is free for all participants. You will need access to a phone line and a computer with internet access for this webinar. To participate, please complete the online registration HERE: http://vovici.com/wsb.dll/s/17fb9g426e9 . If you are a part of any organization that wants to get involved in helping this summer, I encourage you to pass this information on to the leader of your group. Will I See You at IHOP Tomorrow? Posted on February 22, 2010 by Kathy T.
You can bet I’ll be there for free pancakes!! Tuesday, Feb. 23 is another big day for breakfast bargain hunters. From 7 a.m. through 10 p.m., IHOP will be giving away free pancakes in celebration of National Pancake Day. Customers will get a stack of three buttermilk pancakes at no charge, though the restaurant is encouraging customers to make a donation to the Children’s Miracle Network. It hopes to raise $1.75 million in donations. Posted on February 21, 2010 by Kathy T.
Linking the editorial from the Daily News Journal about LaVergne High School. We wish Daniels well as he prepares to leave La Vergne High, because It isn’t an easy place to be the principal. With a large number of low-income students, a highly transient population and movement from the Antioch area into northern Rutherford County, La Vergne High is no place for wilting violets. Overall I think there are some fantastic teachers there, but absolutely there are some bad apples. I don’t have any specific gripes again Mr. Daniels, but I do think Mr. Ash will immediately start some housecleaning. He’s not going to tolerate “Pants on the Ground,” bad language, kids making out at lunch, etc. He will be out in the halls every single day and won’t put up with bad behavior. No he’s not perfect by any means – I know his former students are moaning and groaning. However the proof is in the pudding and if we see improvement across the board – from student behavior to teachers doing a better job (for example – if the emphasis is actually on kids being able to learn math rather than panicking and feeling defeated because they don’t have a pencil), then I’m all for it. Posted on February 19, 2010 by Kathy T.
Congratulations to LaVergne’s own No More Fortune Cookies who will have her work exhibited in this art show. 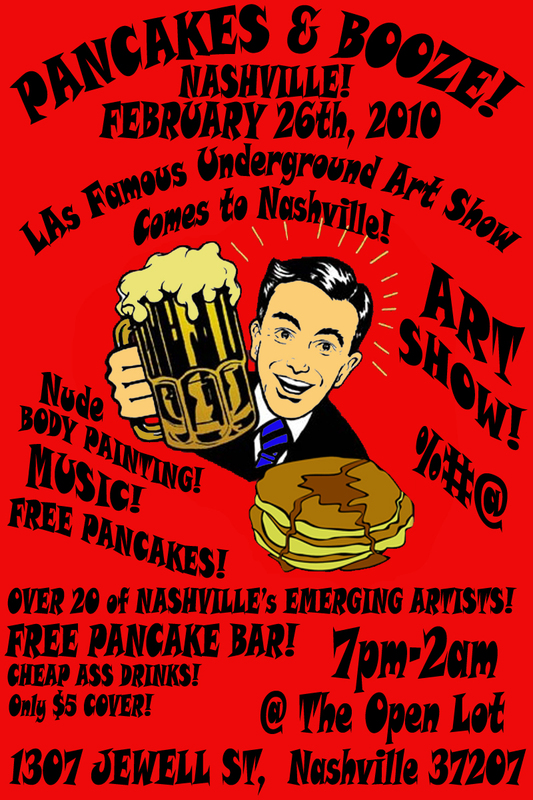 Scheduled a week from today from 7pm – 2am at The Open Lot in Nashville. Who wants to go? I may be able to talk my husband into it if he reads the “poster” closely. Posted on February 18, 2010 by Kathy T.
The much-anticipated, much-ballyhooed HobNobLaVergne is scheduled to launch soon. Formal press releases have been sent, but here’s the info. For the record, at this time I am not nor will This is LaVergne endorse the Town Hall Meeting. Given the feedback of our readers along with other concerns, I have formally taken a step back for now. However, if you’re interested in hearing more please attend, ask questions, and feel free to offer any feedback. I wish Mr. John Iaccheri and the other HobNob staffers GREAT SUCCESS for what I hope will be a wonderful addition to our community. Posted on February 16, 2010 by Kathy T.
A benefit dinner for the family of Tim Kirsch, who died Feb. 6, will take place from 5 – 8 p.m. today at Chef Wang’s , located at 1145 N.W. Broad St . Allen Wang, owner of Chef Wangs, will donate a portion of the cost of the meals to the Kirsch family. Tim Kirsch was involved with the La Vergne youth baseball program as an umpire. He did not have insurance. For more information, contact Mayor Ronnie Erwin at 615-394-2821.